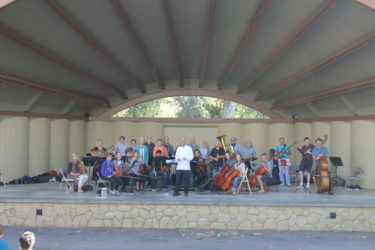 The Ojai Pops Orchestra presented their first public concert on Sunday October 16, 2016 at 3:30 pm at Libbey Bowl in Ojai, CA. The orchestra brings together musicians, conductors, and composers to play Pops music in a full orchestra. We will play showtunes, jazz, movie music, new scores, and more. Libbey Bowl is home to the world famous Ojai Music Festival. Ojai is a spectacular small town. Performance level required: Intermediate to advanced orchestral musicians such as college music majors, music teachers, and other adult musicians and students. Must be able to sight read well. Sign up for our mailing list for updates, specials, and new information. The Ojai Pops Orchestra Workshop is sponsored by Music 4 Kids, a 501(c)(3) tax exempt nonprofit organization and the City of Ojai.